A few days ago, after speaking at a blockchain meetup in New York, I saw a friend hurriedly approach me. “Stephen, can we talk?” he whispered, his eyes nervously surveying the room. I took a second to look at him. His eyes were bloodshot, and his expression was peculiar… was that fear? Excitement? Awe at my remarkable speaking abilities? Of course, I told him, and we moved quickly to a private corner of the room. I squinted to make out the text, “Meet Virtual Currency Girls, The Cryptocurrency themed J-Pop group.” Then the picture came into focus. Admittedly, masks, maid outfits, and cryptocurrencies make a rather scary combination. Disentangling the hype: is Asia the center of the blockchain world? But, is that true? Is Asia the center of the blockchain world? And how do the East and West actually compare in the cryptocurrency and blockchain space? 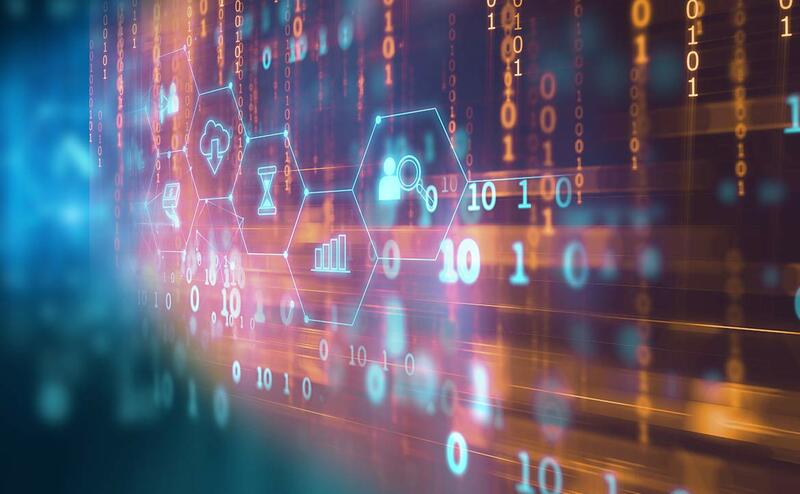 As I’ve found in my research and experience hosting blockchain events in the US and Asia, Asia leads the West in terms of community, infrastructure, and adoption, but lags behind in technical talent and entrepreneurship. To be fair, trying to compare “Asia” and the “the West” is an oversimplification. China’s blockchain ecosystem is remarkably different from Singapore’s, just as Switzerland’s is distinct from the US. Trying to lump countries into regions could be naive, and at worst, misleading. However, I think there is use in contrasting the two regions. As the Tech In Asia platform proves, there is a pan-Asia tech community. And, as research has shown, networks effects mean that regional success does matter. In other words, what happens in Singapore does effect China and vice-versa. 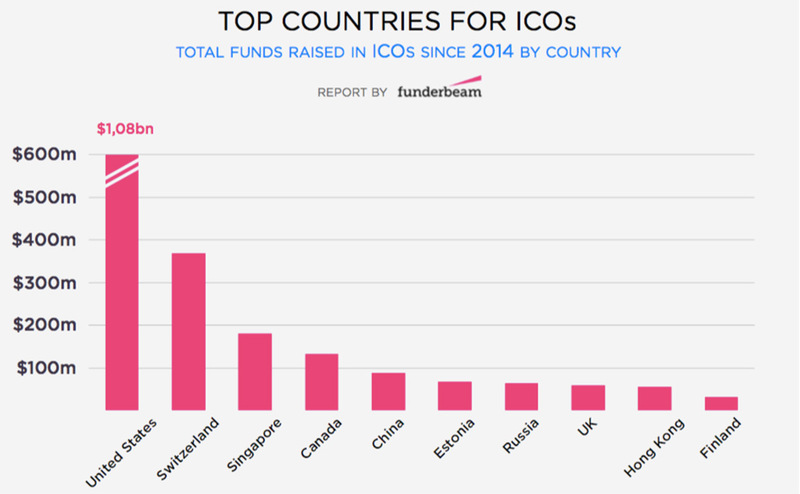 By the amount of money raised in ICOs, western countries have a strong lead - the US raised a disproportionate amount of the money from 2013 to December 2017, as shown below. USA’s lead is not a certainty, however. Because of ambiguity over US regulations, many ICOs have registered in Singapore instead of staying in the US. Nonetheless, for the time being, the US and Switzerland hold a sizable lead. We can also measure creator success by looking at the distribution of blockchain programmers around the world. Though it’s difficult to get exact numbers, we can approximate the location of developers by the regional distribution of Github contributors. Again, Western Europe and the US dominate the developer communities for most major projects. 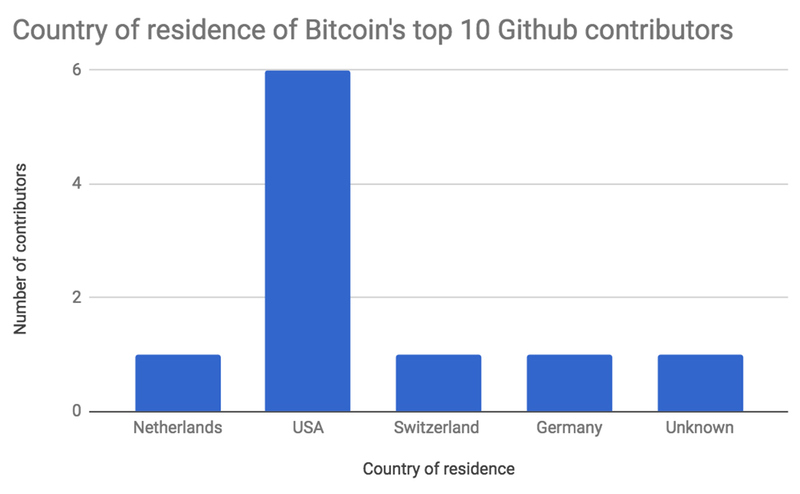 The top 10 contributors for both Ethereum and Bitcoin all seem to live in Western Europe or the US - often from places like Switzerland, Germany, and New York. When it comes to blockchain, creators aren’t necessarily the people who control the chain. Instead, the people who create consensus for a chain can be more influential than the people who invented it. These “maintainers,” miners in the case of proof of work chains, are an essential part of the ecosystem. By and large, Asia has an early and substantial lead in this category. Chinese miners made a splash on the mining world stage in 2013. 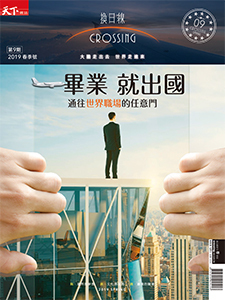 At that time, the Yuan hit a seven-year low and many Chinese investors began to move money out of the yuan and into other markets. 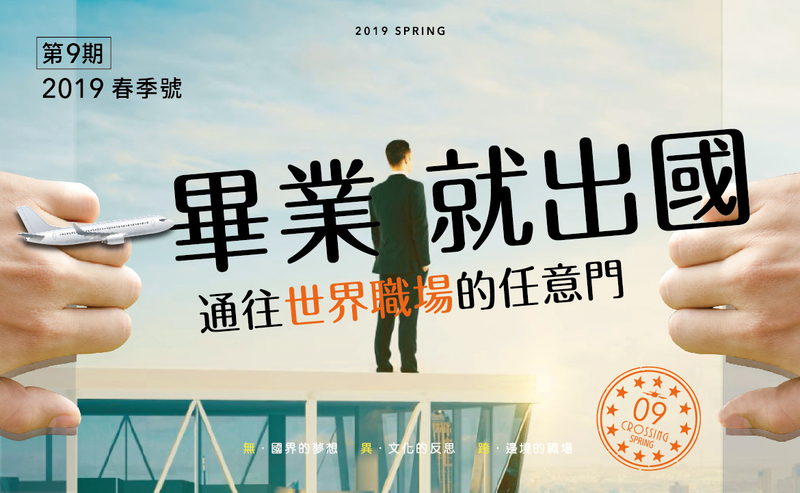 It’s also this year that Jihan Wu founded Bitmain - the world’s largest bitcoin mining company. Since then, a combination of cheap electricity, government relationships, and manufacturing expertise made China the world leader in mining. In the first half of 2017, some groups estimated that 70% of all mining took place in China. In late 2017, however, the Chinese government began to crack down on cryptocurrency mining. In the months that followed, an exodus of miner left China to set-up bases in other parts of the world. Chinese owned mining pools looked to relocate to places like Canada, Georgia, and Iceland. 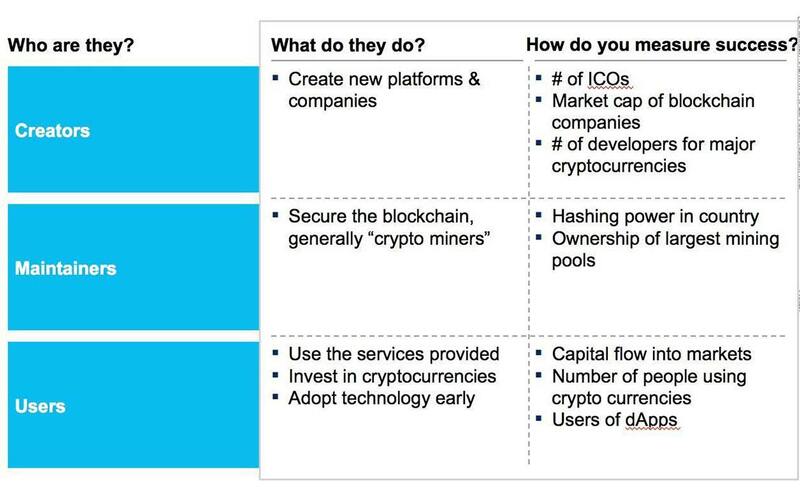 Despite these changes, Chinese miners, who are registered in Asia, still dominate mining. 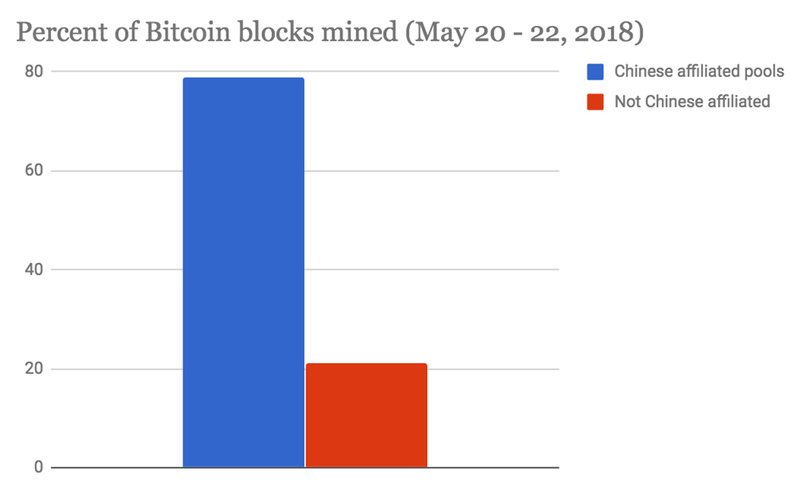 In the last 48 hours, for example, about 75% of all bitcoins mined came from Chinese-controlled pools. *Though these pools may be Chinese affiliated, this does not imply that all mining comes from this area. For example, a Chinese mining company might mine in Canada for a Chinese-affiliated pool. When it comes to securing the blockchain, Asia has an early lead that will likely persist. Miners, like Bitmain, not only mine but also create the mining hardware. The result is a strong incumbent advantage that will likely persist. Finally, does Asia have a stronger blockchain community than the West? To answer this, we looked at two measures of user strength: investment and adoption. If we measure by the amount of money flowing into cryptocurrencies, then Asia comes out slightly ahead of the West. Previously, China contributed to up to 80% of all cryptocurrency trades; however, since recent crackdowns in China, countries like Japan and Korea have emerged as strong leaders. 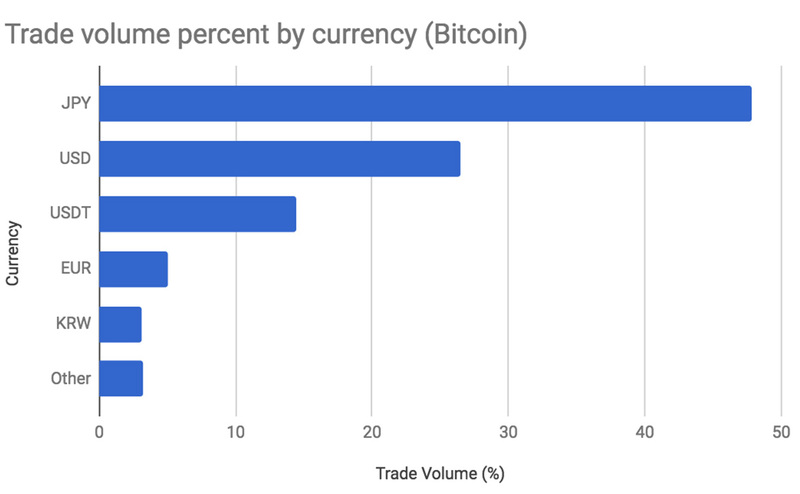 In the graph below, an estimate of Bitcoin trading in early 2018, we can see that Japan and Korean currency make up slightly more than 50% of the total market. Similarly, if you look at general awareness of cryptocurrencies, then Asia again has a slight lead. 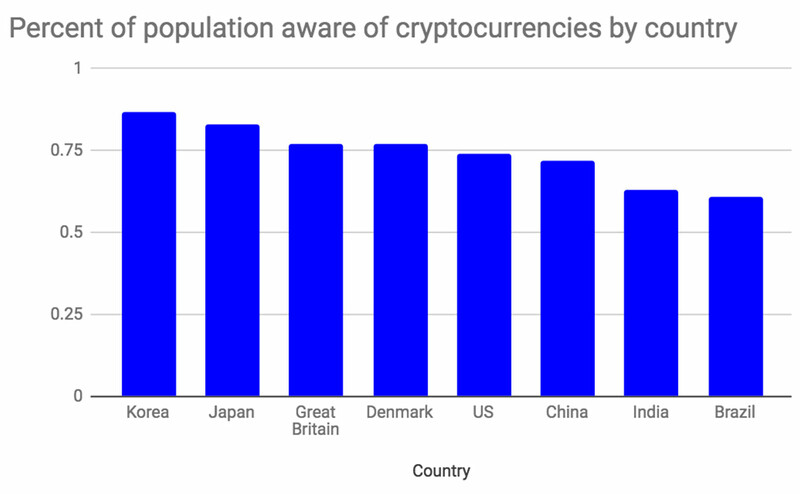 Estimates by Dalia Research in March 2018 show that Korea and Japan have the highest percent of the population who are aware of cryptocurrencies. Anecdotally, this seems to align with my experiences working with Korean and Japanese colleagues. When Bitcoin lost 50% of its value in Korea, hundreds of young men in Korea posted online pictures of things they destroyed in anger: these included desks, computer monitors, and even a bathtub. They also destroyed any doubts I had that Koreans are really, really into cryptocurrencies. The past two waves of tech innovation - the social wave and then the mobile wave - both centered squarely around Silicon Valley. The next, the AI wave, has found itself concentrated in the US, UK, and parts of Europe. But, the blockchain world? It’s distributed - finding pockets of success in unlikely places like the Maldives, Switzerland, and Singapore as well as larger markets like Korea, Japan, and the US. 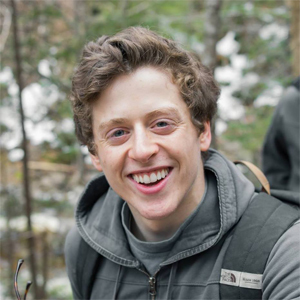 So, should my friend leave New York to go work in Blockchain in Asia? Maybe. But, maybe not. Asia is one of the central forces behind blockchain’s rise. However, in many ways, Asia has significant room to grow. That said, if he’s looking for a combination of music, lucha libre masks, and maid outfits, then he better get his bags packed because Japan is the only place for him.